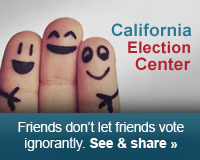 Yes, I know of lot of Californians have already voted by mail. But if you haven’t voted yet, or perhaps aren’t even sure you want to vote, let me encourage you right now. WHY TO VOTE: If you love God, you’ll want to love Him with all of your heart, mind, soul, and strength. This greatest commandment also means loving God in the voting booth — for the sake of good government and laws. And if you remember the second greatest commandment, “Love your neighbor as yourself,” you’ll definitely want to vote and vote wisely. Because you must do your part to stop or at least inhibit bad government from harming your neighbors with bad laws that crush family values, justice, fairness, ownership, and all that is good and sacred. HOW TO VOTE: You simply cannot trust campaign ads and definitely not the “Republican voter guide” or “Democratic voter guide” sent to you in the mail. These contain “endorsements” paid for by the candidates themselves (read the fine print). So don’t rely on voter guides in the mail unless they are from a trusted, recognizable source. 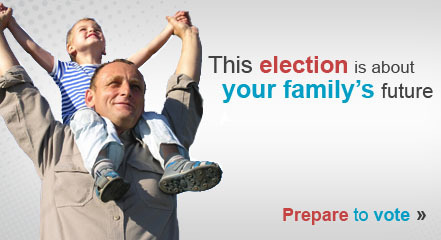 Right now, many principled Californians are being helped by our pro-family Election Center. While SaveCalifornia.com doesn’t support or oppose candidates, we provide links to voter guides that list where candidates and officeholders stand on important issues. So please, visit with your sample ballot in hand, and share it with your friends. When you become entitled to exercise the right of voting for public officers, let it be impressed on your mind that God commands you to choose for rulers, “just men who will rule in the fear of God.” The preservation of government depends on the faithful discharge of this duty; if the citizens neglect their duty and place unprincipled men in office, the government will soon be corrupted; laws will be made, not for the public good so much as for selfish or local purposes; corrupt or incompetent men will be appointed to execute the laws; the public revenues will be squandered on unworthy men; and the rights of the citizens will be violated or disregarded. If a republican government fails to secure public prosperity and happiness, it must be because the citizens neglect the divine commands, and elect bad men to make and administer the laws. Everywhere you look, you see bad news about the consequences of America embracing liberal ideas and abandoning God. But did you ever think how people with moral values have been swept up by some liberal ideas too? Look at this election. If everybody who said the word of God was true, or better yet, that the Bible is their standard for life, voted — can you imagine the good government that would result? Or if people with moral values actually knew how to vote and didn’t get distracted, can you visualize the bad politicians — and even the bad judges — that could be swept from office? But the liberal philosophies of pleasure-seeking (resulting in sloth) and self-centeredness (resulting in lack of love) have weakened what used to be called the “moral majority” in America. Because twenty or thirty years ago, there were a lot of moral Americans who remembered what duty meant. But many of those old timers have died off. So for the sake of our generation and future generations, it’s high time for you and I regain an ethic of love and logic — to love God and our neighbors, and to understand the technological and historical opportunities we have to make a difference. For it is hypocritical to complain about bad news if we refuse to vote wisely or help others to do the same. This ethic of love and duty is especially needy this election, when evil wants to take more territory and when the opportunities to do good are among the highest in California history (because of low-voter turnout).